Customers are what make your restaurant thrive. But, do you have an idea of the path your customers take to arrive at your restaurant? Every business owner understands that a successful business starts with driving sales and revenue. Occupied restaurant seats lead to full cash registers. But how much are your customers really worth? 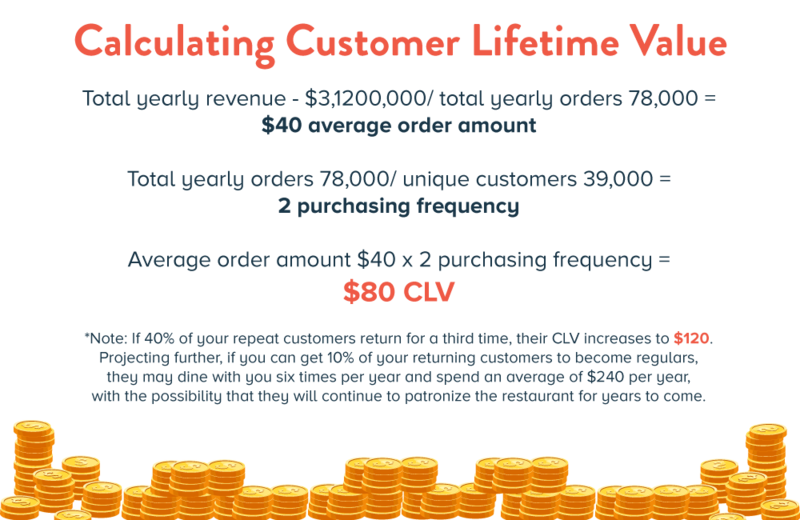 Let’s explore the concept of Customer Lifetime Value (CLV) and what it means for your business. One particular metric that many business owners consider is their Customer Lifetime Value. Simply put, this is the dollar amount that a customer spends with you over a period of time. Not all customers can be considered equivalent when it comes to a monetary value; there’s a significant difference between a fickle explorer and a loyal regular. Ideally, you’d like to turn those first-time diners into repeat customers. To calculate the Customer Lifetime Value for your restaurant, start by identifying the average order amount. To do this, divide your total revenue by the total number of orders over a set period of time (ideally a full year to account for any seasonal fluctuation). This figure is a good benchmark to refer to when considering not only CLV, but how to increase the typical order amount as well. Next, you’ll need to determine how frequently your customers visit. Divide the total number of orders by the tally of unique customers. This will give you a figure for your average customer’s purchasing frequency. ** Note that this can be an inexact science. Some customers pay in cash, and not all point of sale systems log your customer names in a sortable format. Try using some rules of thumb to estimate. Restaurants in tourist-friendly areas will have more unique guests, whereas more rural locales will have a smaller customer base and naturally more recurring customers. Can you estimate what percentage of your customers have eaten with you before? To finish calculating Customer Lifetime Value, just multiply the purchasing frequency by the average order value. This is the customer’s value over the course of the year. We have one more variable to consider: how many years are in a ‘lifetime?’ Longstanding restaurants and brands can last generations. Starbucks uses 20 years as an expectation for its repeat customers. If you’re less established or on a shorter timeline, consider using five years as the window you can expect to make money from your typical customer. When it comes to Customer Lifetime Value, the location of your business should be taken into consideration. If your business is in a densely populated area or features a fair amount of tourism traffic, you will enjoy some first-time customer traffic naturally. Your CLV may trend a bit lower, but you have the opportunity to win over that many more people. The opposite is true for those restaurants in more rural or secluded areas. These locations rely on loyalty and repeat business, meaning the CLV figures must be higher by necessity. The good news is that a positive first impression goes that much farther in terms of driving tangible future sales. Need advice on how to attract first-time customers to your restaurant? We’ll dive into that next. We also discuss this in our 9 Simple Restaurant Marketing Ideas blog. Customer Lifetime Value can give crucial insight into how much money your customers are worth beyond just today’s order. You can also get a picture of how much you should be spending on acquiring new customers in the first place. The goal of any marketing or advertising campaign is to generate a positive return on investment. So how do you ensure you’re maximizing these returns and getting the most out of your marketing efforts? To win new business, customers must first discover you. Everything from the sign on your front door, to word-of-mouth, to search results on popular search engines play a part in enticing first-time customers to come in for a visit. Every avenue counts, although restaurants in more populated areas have a natural advantage. Once your name is out there, potential customers can begin their consideration process. Some questions they may ask themselves: do you serve what they’re in the mood for? Is your price range within what they’re willing to spend? Are you in close enough proximity to their home? In the era of smartphones, even hungry people right outside your door may pause to qualify your restaurant before giving you a shot. They have access to photos, reviews, and business information right at their fingertips. This is why your online presence is crucial. Is there enough positive and accurate information about your business online to inspire a customer to pay you a visit? The conversion aspect of funnel comes into play when a customer finally decides to dine with you. Ideally, the experience is in line with the customer’s expectations. Are the most popular menu items available? Was the customer greeted promptly by a friendly staff? Did the food itself win them over? If your restaurant provides consistency in these respects, your first-time customers have experienced a positive representation of your business, and your regulars can rest assured that they’ll be pleased the next time they come back. After the bill is paid, the customer still has more to offer your business. This part is all about retention. A memorable dining experience, whether positive or negative, can result in an online review. All business owners should be conscious of their feedback and manage accordingly, as this content becomes part of the consideration process for the next round of customers. An equivalent method of receiving feedback can be in the form of a simple survey card with the check, which gives the opportunity for the customer to leave contact information for future communication. This is absolutely an invitation for follow-up business, so act on it! Start by putting together a list with all of your gathered customer information. Then, you can create a monthly newsletter for your customer base to keep them in the know and keep your restaurant top of mind. Do you have rotating specials that might catch their interest? Do you host live events? Even consider offering coupons or promotions to inspire them to return as well. 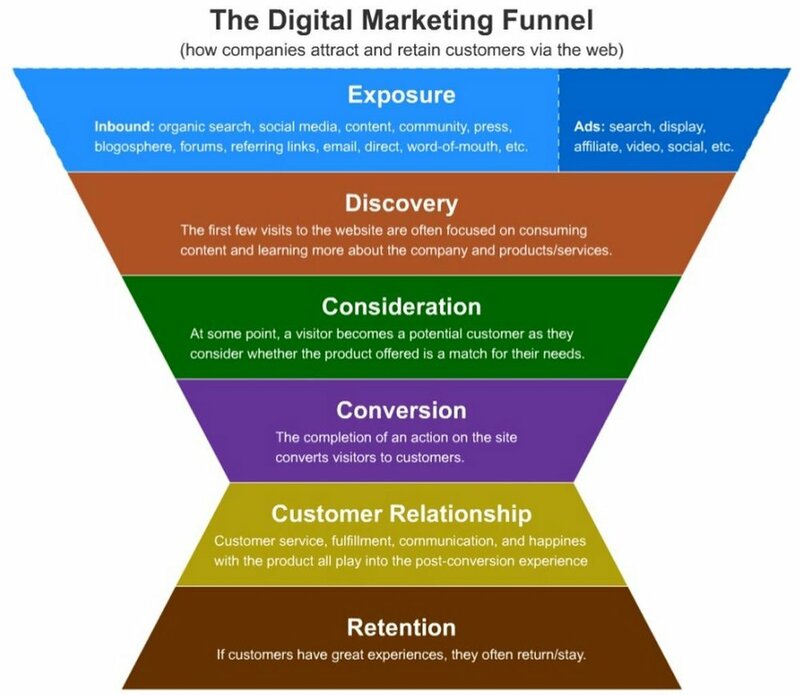 If you work potential diners through the marketing funnel effectively, retention should come easily. It starts with making people aware of your restaurant through non-invasive methods and ends with putting in the effort to retain them as loyal customers through meaningful communication. The Customer Lifetime Value figure is influenced by each of these individual steps. Being cognizant of the decision-making process help you as a restaurant owner maximize the money that each individual customer is willing to spend over time. To improve your restaurant’s own CLV, try making small, but effective refinements to the customer experience. There’s plenty of room for creativity and improvement!